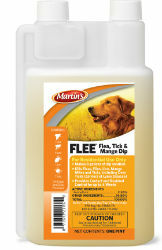 Controls fleas for up to 28 days. One pint makes eight gallons of dip. For use on: dogs, puppies (over 4 months), kennels, dog houses, and dog beds. Effective Against: flies, fleas, lice, mange mites, and ticks.